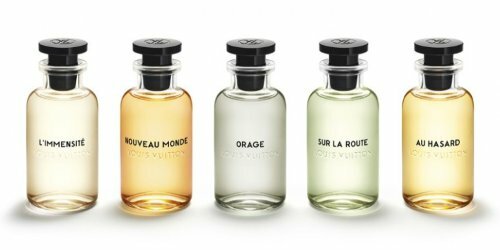 Louis Vuitton will launch a new collection of fragrances for men in May. As with the 2016 collection for women, the scents were developed by perfumer Jacques Cavallier. L'Immensité ~ inspired by pickled ginger, with ginger and grapefruit, labdanum, sage and rosemary. Nouveau Monde ~ an oriental inspired by the explorer Brazza, with saffron and cocoa. Orage ~ a clean woody fragrance evoking the scent of white sheets and white shirts, with notes of bergamot, vetiver, iris and patchouli. Sur la Route ~ a fresh sunny fragrance with citrus, bergamot, fresh cut grass and cedar. Au Hasard ~ a sandalwood fragrance from a sustainable source, with cardamom and musk. 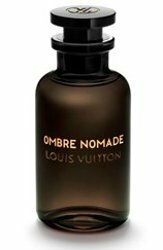 Ombre Nomade (not shown below) ~ an oud fragrance to wear alone or layer. Ombre Nomade will be exclusive to the Middle East until August. Update: additional notes include incense. The Louis Vuitton masculine line will be available in 100 and 200 ml and in travel sizes. Genuinely looking forward to these. The first round were very feminine even though initially they werent marketed specifically to women. I love the bottles , and the first two peaked my interest. If they roll out a miniature set as they did with the first batch of releases they may just find space in my cabinet. Note that they aren’t putting “homme” on the bottles here either, and they note that a few of these might appeal to women. But I’m sure these will be more conventionally masculine than the first set. I’m scared to even ask what prices start at. No problem, we follow don’t ask, don’t tell.